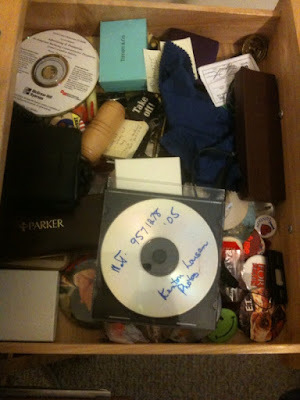 Kenton's Infotainment Scan: What's in your junk drawer? Is it rude to show your drawers in public? I came across a cool idea today on Rob Walker's MURKETING website. It's the art of Paho Mann, who photographs people's junk drawers and medicine cabinets under the banner of "high-concept art." "My work explores the persistent mark of individuality in a culture that brands, packages, and relentlessly promotes conformity. Even among those who attempt to fit into society, there is an amazing wealth of information each individual reveals in near-privacy, spaces such as junk-drawers and medicine cabinets." "The near-private nature of these spaces force the viewer to contend with the natural desire of humans to collect, categorize, and by doing so, manage to give clues about their personality and identity." If that's true, then what does that say about my junk drawer, above? Two CDs, one featuring my stand-up publicity photos (oh, God), and the other a CD-ROM to accompany "Advertising & Promotion" textbook (circa 2005 - they still made CD-ROMs then?!). The Tiffany & Co. Conan O'Brien keychain I got when I left the show (in the blue box, of course). My button collection, including "Take Off" (Bob and Doug! ), E.T., Tears for Fears, smiley face, Bullwinkle For President, I heart London, and Mork and Mindy. A box of Parker pens from an ex-girlfriend's dad, engraved with my name, and a second box of pens, engraved with my late stepdad's name. An old wallet containing an old Costco and KLM frequent-flier card. A Post-it note with the key lines from Nizlopi's JCB on it. A soft cloth for glasses. A King's Head membership, back from when you needed one. The wooden handle to the drawer itself. Clearly, I'm an egotistical, sentimental, alcoholic prankster who likes to have clean glasses. Any questions? Hurtin' for a blog idea? Well, what's in your drawer, then? That is a good blog idea. Too bad all my drawers are junk drawers.